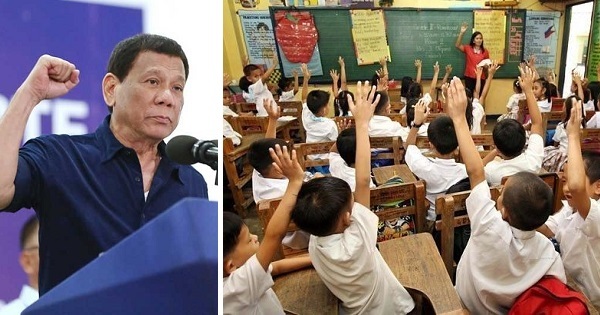 MANILA, Philippines – President Rodrigo Duterte recently approved a proposal that would make drug education mandatory from kindergarten to Grade 12 students next school year, SY 2019-2020. Based on data from the United Nations Office on Drugs and Crime (UNODC), the prevalence of drug use in the Philippines is lower than the global average; however, the Philippines had the highest rate of methamphetamine use in East Asia, according to the United Nations (UN). The UNODC report in 2016 revealed that most barangays in Metro Manila are affected by illegal drugs. The same could be said in many barangays across the country. Duterte wants to eradicate drugs from the Philippines. He promised to remove drugs in the country within six (6) months in his term but did not realize that the problem was much bigger than he expected. In a bid to stop children from even trying out drugs, the Department of Education (DepEd) proposed the mandatory inclusion of drug education in students in K-12 in the upcoming school year. Presidential Spokesperson Salvador Panelo confirmed that DepEd Secretary Leonor Briones presented the curriculum for drug education during the 34th Cabinet meeting led by President Rodrigo Duterte at Malacañang Palace last Wednesday, February 6. While Panelo did not elaborate on all the items talked about during the Cabinet meeting, he shared that DepEd has already started its campaign through school-based activities like poster and slogan-making, counseling and coaching, and rather controversial move to test teachers and high school students for drugs. DepEd has also established barkada (peer) centers in its barkada kontra droga (peer groups against drugs) campaign. The government agency also been working on a comprehensive education material which aims to bolster drug prevention program in public schools. This program is created in coordination with the Dangerous Drugs Board and the Department of Health (DOH). Cabinet Secretary Karlo Nograles confirmed that the president had given the go signal for the DOH to teach the ‘Preventive Drug Education Program’ starting next school year.